General description of Interface Protocols. A Protocol defines a set of Entity types. This class provides also the notion of Active Protocol, as a working context, defined once then exploited by various Tools and Libraries. Returns a unique positive CaseNumber for each Recognized Object. By default, recognition is based on Type(1) By default, calls the following one which is deferred. Evaluates a Global Check for a model (with its Graph) Returns True when done, False if data in model do not apply. Returns True if type of <obj> is that defined from CDL This is the default but it may change according implementation. Returns True if <model> is a Model of the considered Norm. Implemented in StepData_Protocol, and IGESData_Protocol. Implemented in StepData_FileProtocol, StepData_Protocol, IGESData_FileProtocol, StepAP214_Protocol, IGESData_Protocol, IGESBasic_Protocol, IGESGraph_Protocol, IGESGeom_Protocol, IGESDimen_Protocol, IGESDraw_Protocol, IGESSolid_Protocol, IGESDefs_Protocol, and IGESAppli_Protocol. Creates an empty Model of the considered Norm. Sets a given Protocol to be the Active one (for the users of Active, see just above). Applies to every sub-type of Protocol. Returns a type under which <obj> can be recognized and processed, according its rank in its definition list (see NbTypes). By default, returns DynamicType. Returns a unique positive CaseNumber for each Recognized Type, Returns Zero for "<type> not recognized". 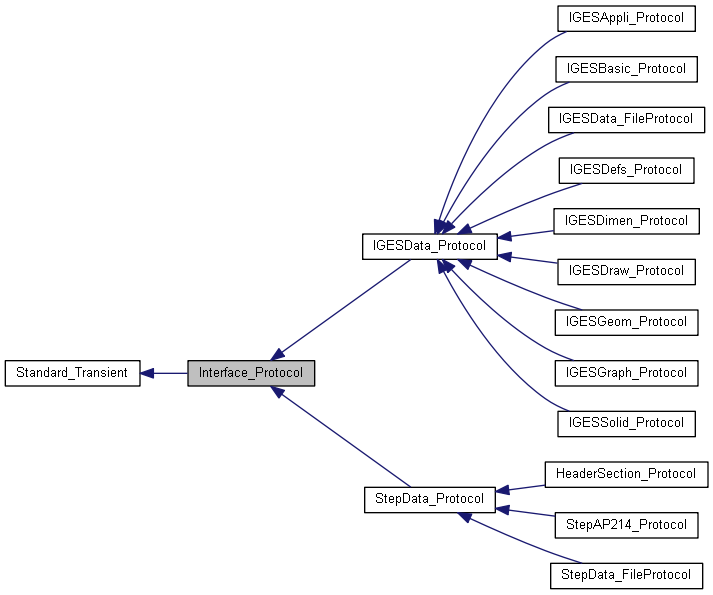 Implemented in StepData_Protocol, StepData_FileProtocol, IGESData_Protocol, IGESBasic_Protocol, IGESGraph_Protocol, IGESGeom_Protocol, IGESDimen_Protocol, IGESDraw_Protocol, IGESSolid_Protocol, IGESDefs_Protocol, IGESAppli_Protocol, StepAP214_Protocol, and HeaderSection_Protocol. Creates a new Unknown Entity for the considered Norm.